multimedia on Go Ninja, Go Ninja GO! Hey, consider more low CMC fliers and cards with delve? More low CMC fliers who give you value when they ETB can take more advantage of ninjutsu since they will most of the time hit a player without being blocked. You want to bounce them back to your hand so they can ETB again. Delve spells have high CMCs when revealed with Yuriko, but the casting cost can be reduced by exiling cards from your graveyard. Baleful Strix : very good with ninjutsu. Cloud of Faeries : good with ninjutsu. Spellstutter Sprite : good with ninjutsu. 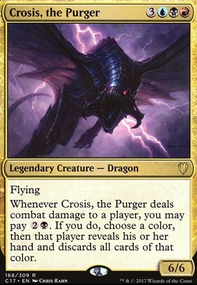 Smuggler's Copter : more draw and good enabler for delve. Skullclamp : lots of 1 toughness creatures is good with Clamp as backup draw. I'm suggesting to consider cutting the opponent mill strategy because there's not enough of it. 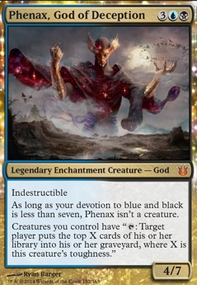 With opponent mill in multiplayer Commander go all out with Oona, Queen of the Fae or Phenax, God of Deception as Commander or infinite combos with Altar of Dementia / Altar of the Brood . Opponent mill is a not a reliable strategy unless you have a lot of it and are focusing on it. Self-mill is powerful, but opponent mill is not. Most of the cards to consider cutting are high CMC cards and replace them with low CMC cards. The delve spells are upgrades for some of the split cards. multimedia Thanks for all the great suggestions! Among the lands, I plan on using Command Tower, Tainted Peak, Tainted Isle, and Crumbling Necropolis because I can trade for them with my play group. As for the nonland cards, I'm still in the process of buying the current cards, but Fellwar Stone, Waste Not, and Dark Deal sound super solid esp. for the deck. What would you cut to include these three cards? Again, thanks so much for the suggestions! Hey, to expand on what others have commented on about the manabase here's some budget playable lands to consider adding. All my suggestions will be $4 or less (most are $2 or less). 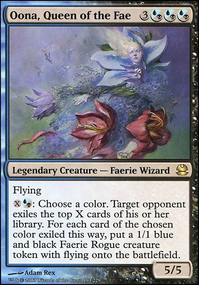 Command Tower: every multi color deck in Commander should play this land. Sunken Hollow: Battle lands have good interaction with lots of Basic lands. Tainted Peak: good interaction with lots of Swamps. Foreboding Ruins: good interaction with lots of Swamps. Fellwar Stone: every three or more colored deck in Commander should play this mana rock. Notion Thief: deny your opponent large draws. Cryptbreaker: staple one drop Zombie since it's so versatile, it can make Zombie tokens or be a draw engine with Zombies. 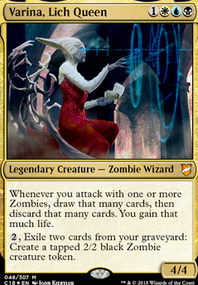 Lord of the Accursed: another Zombie lord, giving all Zombies menace can be a win condition. 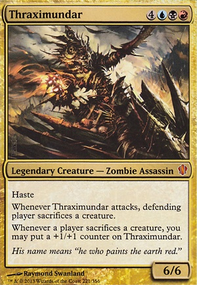 Plague Belcher: combos with Gravecrawler and Phyrexian Altar to kill all your opponents. Diabolic Intent: another powerful cheap tutor. Talisman of Dominance: another two drop Dimir mana rock. Living Death: reanimate a lot of Zombies. Patriarch's Bidding: reanimate all Zombies. Hey, before you get Lili (I presume Liliana of the Veil) which is an expensive card consider first improving the manabase? 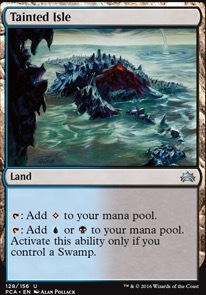 There's several budget lands to consider adding in place of the really bad dual lands. For a little less than the price of Lili you could add all the cards below and Rift/Labman: upgrade the manabase, add some good Zombies and nice support cards. That's much better for your overall deck than adding one card.